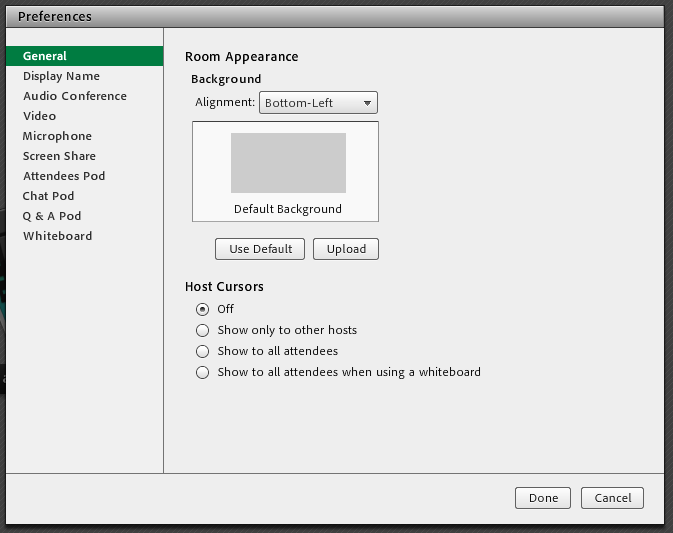 In the General tab, the meeting background image can be set and configured. The background is displayed behind the pods. There are also options to display hosts’ cursors to participants. 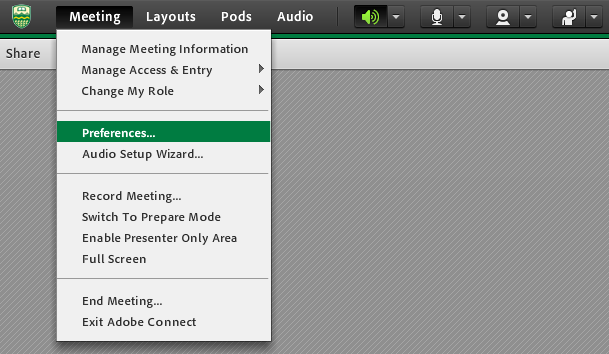 These cursor settings apply only within the meeting; cursor settings for screen sharing can be found in the Screen Share tab. 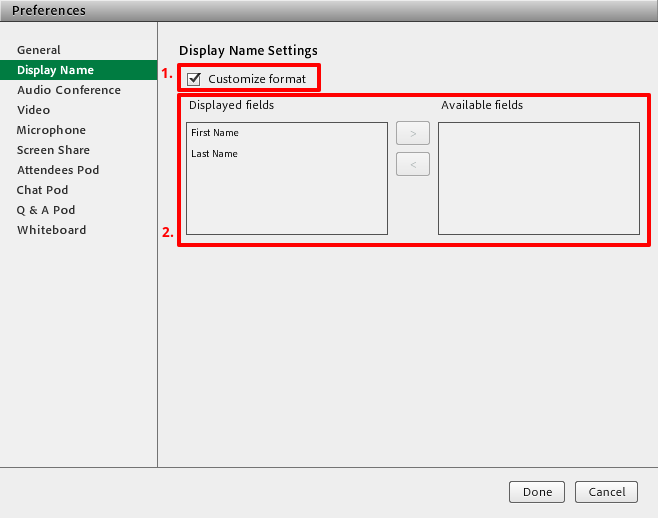 To change how participant names are displayed in a meeting, first check the Customize format box. Fields can then be moved by dragging and dropping into the desired positions. 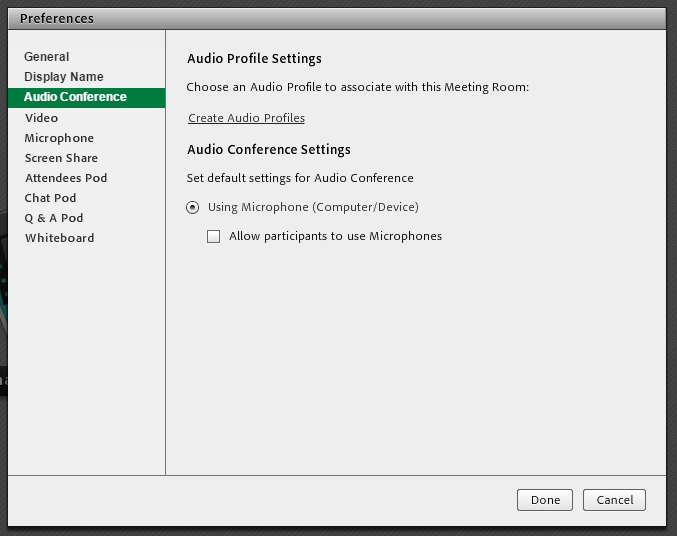 If you would like to enable microphone usage for all of the participants in a meeting, check the box next to Allow participants to use Microphones. 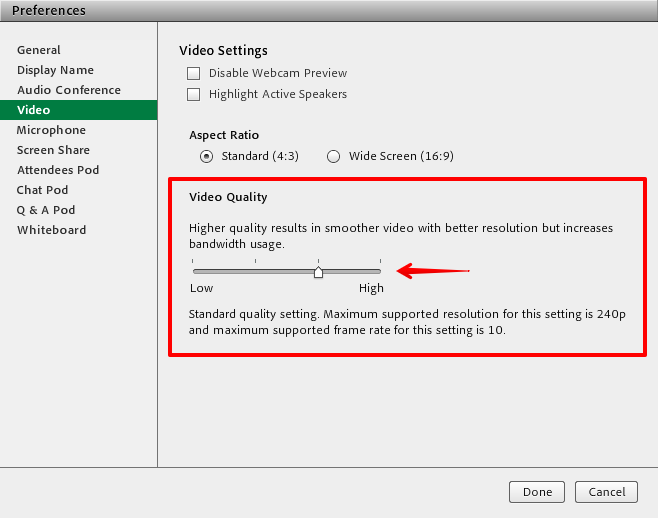 Adjusting the video quality of a meeting changes the amount of bandwidth required for a smooth meeting experience. This setting is especially important in meetings where some participants have slow internet connections. 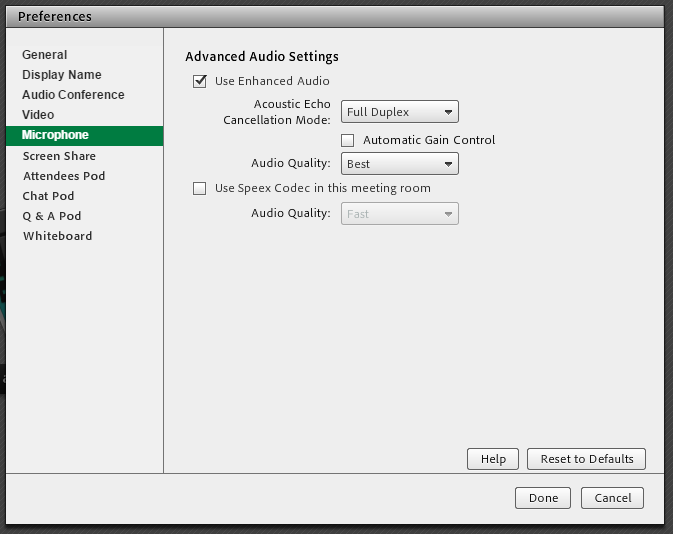 These settings can usually be left as their default values unless participants are experiencing issues with audio in the meeting. For more details, please see Fixing Microphone Problems. 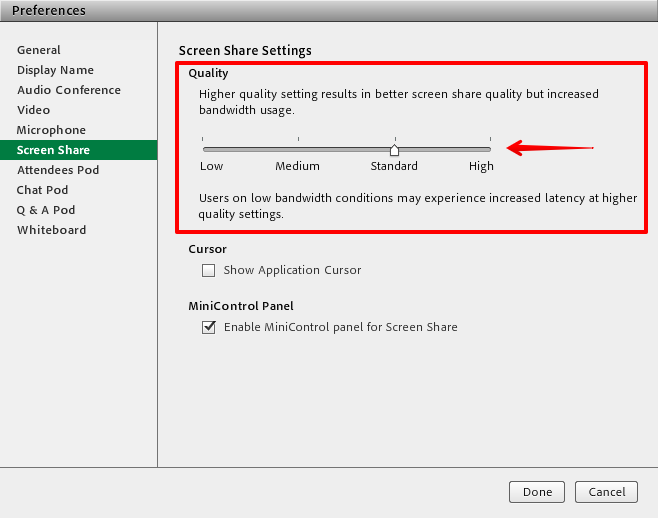 The quality setting for screen sharing affects bandwidth usage as well as display quality. Meetings containing users with slow internet connections may require a lower quality setting to decrease bandwidth usage but this can impact the clarity and readability of your shared screen. If you are using screen sharing to share a single document, using the Share Pod may be a better solution. Under cursor, you can choose whether or not to share the position of your cursor when screen sharing. If this box is left unchecked, participants will not be able to see your cursor on their screen during screen sharing. 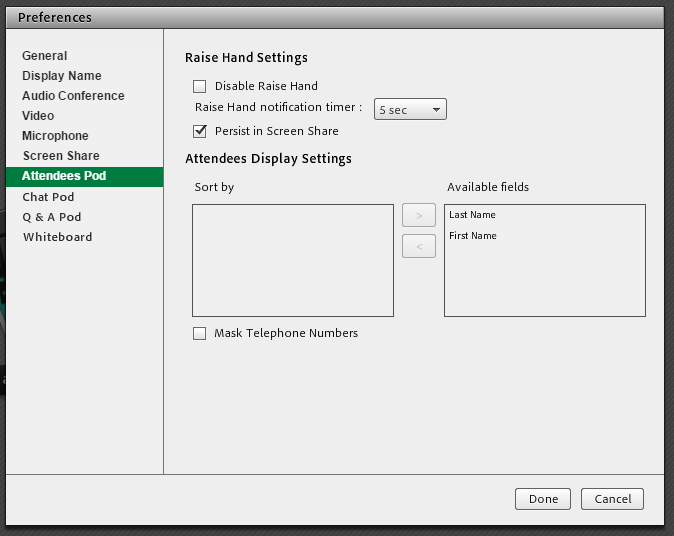 The attendees pod tab can be used to configure the behaviour of raised hands as well as how attendees are sorted in the attendees pod. 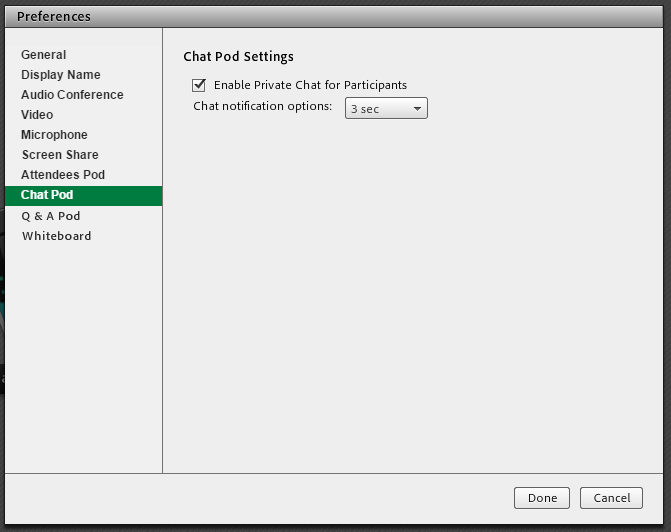 This checkbox can be used to either enable or disable private chats between meeting participants. 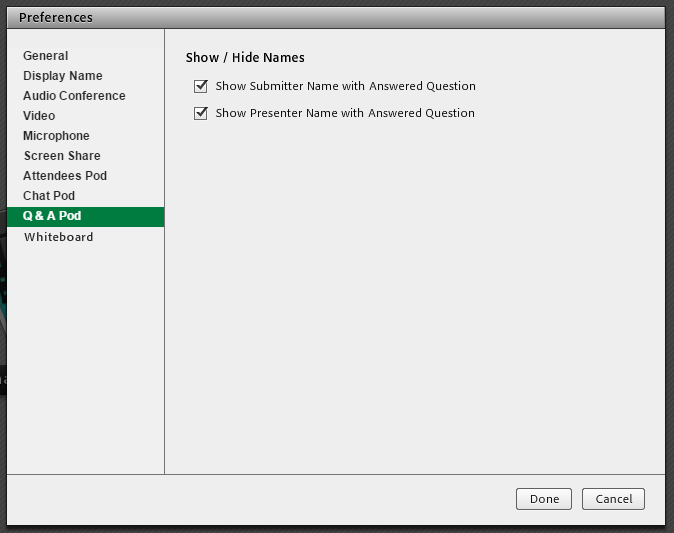 Here, you can choose whether or not participants submitting responses and/or presenters are kept anonymous in the Q & A pod. 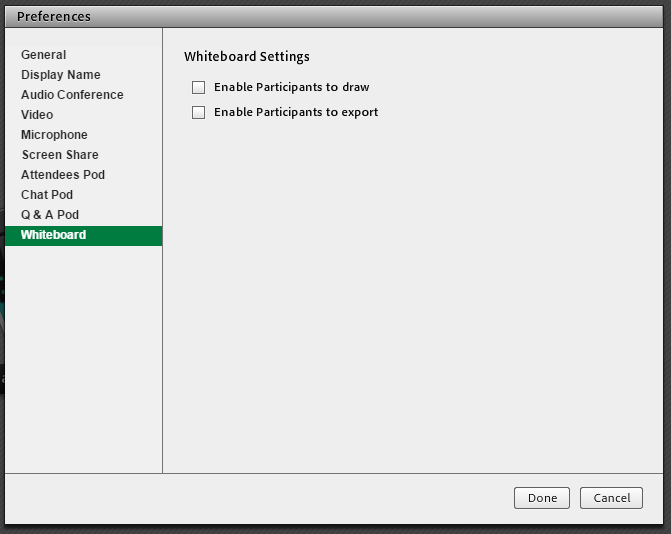 In the Whiteboard settings, you can allow participants to draw on or export the whiteboard. By default, only presenters and hosts can perform these actions.